It’s time to re-think your drink. On these hot days, it can be tempting to reach for a soft drink or other sugary beverage, but the extra empty calories and excess sugar add up to poor nutrition and weight gain. Choose water for the healthiest hydration and no added calories. 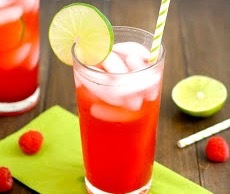 For a treat, mix 100% real juice with seltzer for a lower-calorie, healthy alternative. Try this refreshing sparkler with lime.